The entire world loves money which also includes housewives. They are among those ladies who desire to earn exceedingly well, so they can facilitate their family to live a better and luxuries life. But a common housewife faces many difficulties when she imagines doing a part-time job in a company. While on the other hand, they have to take care of their kids and family. Lots of housewives are sick and tired of unemployment. They are still looking for an alternative which will allow them to work straight from their living room (Home). From side to side housewives have all abilities to maintain perfect balance in between their online plus offline work from their home. Some housewives have lots of unique ideas, but the only thing which lacks is moral support from family. However, if a housewife has full moral support from her family then truly it will act as icing on the cake. Usually ladies are extremely skilled in designing artwork like creating a masterpiece dresses, stitching or embroidery etc. if you have these abilities then you can start your business without any stress. To promote their business housewives can create an online store at myoffstreet.com. For more exposure, they can even design an ideal Facebook page to catch the attention of customers. However, if you have skills in web developing then you can create your own eye-catching online e-store and can earn with command. Housewives need to maintain professionalism no matter they are new or old in the market. The quality of your product is most crucial, if you want to attract millions of daily customers. To make your e-store more demanding and to provide convenience to your clients try to upload images of your clothing along with the price and a little description about the product. You can even sell almost anything at myoffstreet.com all it requires is a combination of hard-work and creativeness, which I personally believes every woman has an intelligent brain which is connected with the heart. Internet is full of wonders and Skype is the latest addition to it. Housewives who are educated enough or those ladies who are highly skilled in any subject can conduct online classes from their living room. They can use fiverr.com to attract students and guide them online through voice chat or video chat depends on persons personal likes. If in case this online teaching through Skype and fiverr.com became an enormous success. Then housewives can launch their own online learning website, where they can schedule online classes for specific subjects. They can even hire few tutors to lower the load from your shoulders. This online teaching works brilliantly well, and the chances of converting your online teaching into a private institute are extremely high. Blogging is one of the easiest methods for housewives to earn online. It requires less time but needs lots of hard-work with devotion. Housewives favor blogging because with no trouble they can earn up to 10 to 20 thousands dollars per month. However, blogging needs lots of patience. To put up a flourishing blog we need to uphold calmness, and should stick to our goals. The key problem we usually hear about housewives and blogging is the lack of knowledge. We usually believe that blogging is all about technology, but now days the blogosphere is changed dramatically. Blogging is a multilevel term which can be adopted for almost anything. Now days even those blogs are getting popular which are not related to technology. Housewives need to select the correct category (Niche) of their blog For example, cooking could be a hot niche for ladies or they can even start a blog related to women’s. This could give a new beginning to the blogosphere where women will give tough competition to man. Ladies can easily earn online by working as a freelancer writer. If they have qualities to write an article like a professional, then they can not only write on different blogs but can also contribute to magazines and newspapers. There are many newspapers, which pay a fare amount for writing featured stories and articles. Freelancing is not an ancient term, its popular since centuries. Freelancing is one of the most popular methods to earn smashingly well. Housewives can take benefits from freelancing by writing paid articles. It takes less time and gives an excellent amount. There are many freelancing sites which paid you once you completed the work on allotted time. 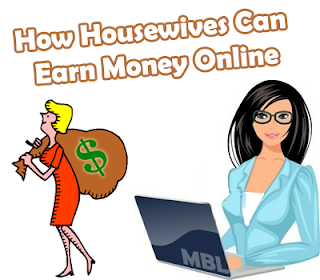 Paid To Click: Housewives can easily earn few bucks from paid to click programs (Websites). Daily we need to view few ads, and in return we get paid. Earn With Fiverr.com: It is an enormous opportunity for housewives to earn extra money. Fiverr.com is a website which allows housewives to select a specific work, and for completing that work, they will receive 5 dollars. For example, I will write 500 articles for $5, I will create a video for $5 and etc. Earn With YouTube: Housewives can convert their talent into videos and can earn with YouTube. YouTube has become no1 Vlogging website, where people uploads videos and get paid for each 1000 views. It’s the best opportunity for housewives, just grab a camera and start filming. Earn With Your FaceBook Page: It appears extremely rare but this does work. If Housewives own a well-liked Facebook fan page, then they can allow users to advertise on their Page. They can earn without doing anything. Housewives can even sponsor a story on your page and can get paid. From The Editors Desk: Last but now the least don’t stop until you achieve the true success. This is the worst scenario when we have nothing in our hand. We need to believe our self because the world impossible itself says I am possible. So, if we trust our abilities then surly success will take us to the next level. Through today’s post, we try our best to help housewives so they can earn like everyone. We hope you have enjoyed the ride. If we miss out any method of earning online for housewives do send your suggestions till then peace, blessings and happy earning. Good Post For Housewives . What's the best way to earn money online without big cost? That's a very serious question and the answer is really very simple. Youtube Pay To Pakistani Uploder :-? Well In Pakistan YouTube doesn't allow publisher to monetize their videos so unfortunately we cannot earn with YouTube. Hope that answers your question, Peace and Blessings. Nopes! I Don't think so Youtube will allow you to do that However, They might ban you in the end so we must show patience until we get it in our Country. Peace and Blessings. Thanks Nasreen For Living Your Comment. Yes, You Can Earn While living in Pakistan. You can even Create a FREE Blog From Blogger.com without any Hesitation Whatsoever. will u plz help to do work online for earn money ? Yes, Sure how we can help.